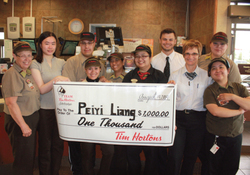 "I am incredibly thankful to be selected as a 2014 Tim Hortons scholarship recipient,” remarked Peiyi Liang at the local Tim Hortons restaurant on August 13th, 2014. “Earning this scholarship will lessen the burden that comes along with paying for post-secondary tuition, and as well, further motivate me to pursue academic excellence. I am proud to have worked for a company that not only provides support for student employees, but all employees who have children or grandchildren working towards a higher education. Thank you for this opportunity." Peiyi Liang of Wetaskiwin is the latest recipient of a $1,000 Tim Hortons Scholarship, awarded for her commitment to giving back to the community. The Team Tim Hortons Scholarship Program is designed to recognize restaurant team members (as well as their children or grandchildren), who believe in giving back to their community through volunteer work and have plans to pursue post-secondary education. Entering its tenth year, the successful program has already helped more than seventeen hundred students across Canada and the United States with more than $1.9 million awarded so far in scholarships. This year another $220,000 will be distributed among 220 deserving students. Tim Hortons is committed to enriching the lives of its valued team members through a number of ‘Team Tim Hortons’ initiatives. The application process for the 2015/2016 school year will open in February 2015. Further information on Team Tim Hortons’ initiatives, application requirements and photos of the 2014 scholarship recipients are available at www.timhortons.com. Tim Hortons is one of the largest publicly-traded restaurant chains in North America based on market capitalization, and the largest in Canada. Operating in the quick service segment of the restaurant industry, Tim Hortons appeals to a broad range of consumer tastes, with a menu that includes premium coffee, espresso-based hot and cold specialty drinks including lattes, cappuccinos and espresso shots, specialty teas, fruit smoothies, home-style soups, fresh Panini and classic sandwiches, wraps, hot breakfast sandwiches and fresh baked goods, including our trademark donuts. As of December 30th, 2012, Tim Hortons had 4,264 system-wide restaurants, including 3,436 in Canada, 804 in the United States and 24 in the Gulf Cooperation Council.